Pasadena Hills City Hall is located at 3915 Roland Boulevard, Pasadena Hills, MO 63121; phone: 314-382-4453. Photo: Country Club Drive and Roland Boulevard, Pasadena Hills, MO. The Historic District was listed on the National Register of Historic Places in 1994. Photograph by one of the team of Matther A. Cerny, Sheila Findall and John O'Dell, 2004, for nomination document, Pasadena Hills Historic District, St. Louis County, MO, NR# 04001281, National Park Service, National Register of Historic Places. The City of Pasadena Hills was established as an incorporated village on March 6, 1928 and all of the properties have been built since that time, but the vast majority were built prior to 1954. As a planned community, the area still retains all of its original resources, including 376 residential buildings (338 single family residences and 38 multifamily apartment buildings). The houses are designed in the styles popular during the mid-twentieth century, especially the romantic revivals: Tudor Revival, Colonial Revival variants (most often Georgian Revival), French Eclectic and Spanish Eclectic styles, as well the increasing popular modern stylistic influences, especially what is now known as Minimal Traditional. The area is still one of the most prestigious residential locations in north Saint Louis County and as such the buildings retain a high degree of architectural integrity and represent some of the best residential design in the region. In addition, there is the Thomas Jefferson School building designed by William Ittner, an addition to a Normandy fire station (which straddles the city limits), one small commercial building, a former service station along Natural Bridge Road. There are 39 other historic resources, including the entry gate tower designed by T. P. Barnett and Company and most of the original landscaping features and public amenities designed for the community by Roland H. Buchmueller, the town planner and landscape architect. These landscaping features include: the fountain, three parks (Roland, Winchester, and Bristol), and other green spaces along medians and boulevards, as well as the 147 historic streetlights that are unique to the community. The neighborhood is located in north Saint Louis County at the northwest corner of Natural Bridge Road and Lucas and Hunt Road, two major arteries in north part of the county. 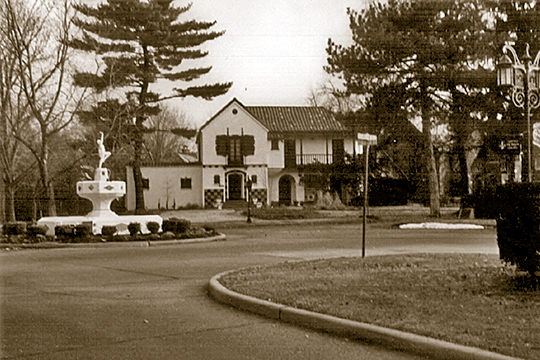 The community is near the northwestern corner of the City of Saint Louis and borders a number of other early Saint Louis County suburbs (primarily Northwoods, Pasadena Park and Normandy), all built in the early twentieth century, but none with the scale and quality of housing, or the planned landscaping features that are found in Pasadena Hills. Just two blocks north is Interstate 70 with the Norwood Hills Country Club located about a half mile further north, having been established four years before Pasadena Hills. To the west is the UMSL campus and Lambert International Airport, with its flight path directly overhead. Karen Bode Baxter, Architectural Historian, for Pasadena Hills Historic Preservation Commission, An Intensive Survey of Historic Resources in Pasadena Hills, Missouri: Final Report, 2003, www.dnr.mo.gov/shpo/, accessed May, 2014.